HE APPEARS TO BE COZY WITH RUSSIA AND VLADIMIR PUTIN. "Russia presents the greatest threat to our national security," the Marine Corps Gen. Joseph Dunford Jr. said in July during his confirmation to be the chairman of the Joint Chiefs of Staff. In an interview with NPR, Flynn seemed to agree, saying that enemies of the United States included, "certainly, Russia, North Korea, Iran, Venezuela, countries like Cuba, certainly China." Yet Flynn traveled to Moscow on a paid trip in 2015, appearing on RT, Russia's state-run news organization. He likened RT to CNN. "It was a paid speaking opportunity," Flynn told the Washington Post. "I get paid so much." 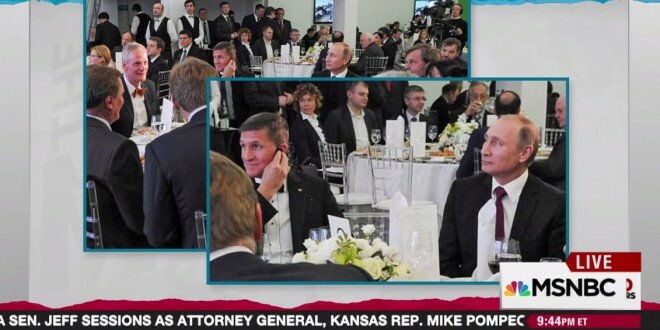 Flynn was seated very close to Putin at a gala and called the symbolism of it "boring," saying that he "didn't have any problem" with the optics. According to Politico in May, Flynn had continued to make "semi-regular appearances on RT as an analyst."